MAX’S ANABOLIC NIGHT PROTEIN POWDER is a slow release Protein powder with added Calming Herbs and vitamins and Minerals to help to recover and feel tired and overworked muscle tissue while your sleeping. 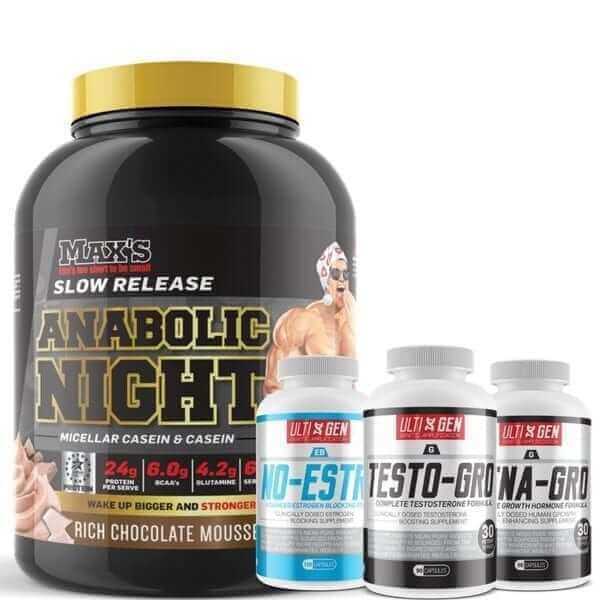 Maxs Anabolic night is a high-quality Casein based protein that is easy to mix and tastes fantastic, and we recommend this at suppkings nutrition if you want something more than Whey before you go to bed that will deliver a rich source of protein and amino acids while you sleep. Stages 3 – 4: During these stages, you move into a deep sleep or slow wave sleep lasting between 10 and 30 minutes where brain activity decreases and your body begins restoring itself mentally and physically. Stage 5: REM or Rapid Eye Movement Sleep, where your brain becomes more active and you dream. REM sleep can last from 5 minutes anywhere up to an hour, and your body and mind continue to replenish their reserves through this stage. During a night’s sleep, your body will cycle through stages 3, 4 and five several times, and it is these stages where you are adequately rested, and most muscle growth occurs. The quality of sleep during these stages has a direct impact on the amount of muscle you will build. More good quality stage 3, 4 and five sleep means greater muscle gains, but only if you have a ready supply of protein in your system. SLOW RELEASE PROTEINS ARE ESSENTIAL like casein. To maximise your growth potential, you need a steady supply of amino acids and small peptides all night that your body can use to repair and build your muscles. This can only come from proteins that are slow releasing like red meat or chicken because fast releasing proteins (like WPI) just stay in your system for a few hours. But there is a catch. You can’t eat a big meal that’s hard to digest before bed because it will disrupt your stage 3 & 4 sleep cycles and inhibit muscle growth. That’s why MAX’S Anabolic Night is ideal because it contains medium and slow release proteins that won’t overload your system or disrupt sleep. MAX’S Anabolic Night is formulated to promote peaceful sleep right through the Stage 3, 4 & 5 sleep cycles, so you recover fully and grow as much muscle as possible. Our Sustained Release Protein Blend contains: To complement our Protein Blend MAX’S Anabolic Night also includes: Anabolic Growth Hormone Complex – Your natural Growth Hormone levels peak during sleep. However, you can further boost levels with the right nutrient mix before bed. Multiple studies have identified L-Arginine, Ornithine, L-Glutamine and Lysine as Growth Hormone stimulators because of their ability to enhance the natural release of Human Growth Hormone. Two natural herbs, Skullcap and Chamomile, are added to MAX’S Nitetime GH to help you sleep well and maximise your anabolic sleep cycles. Both herbs are widely used to promote calmness, reduce anxiety and induce sleep without side effects. These micronutrients are vital components of all muscle building biochemistry and are included to ensure optimal recovery and growth during sleep. Suitable For – Suitable for all levels of trainers is designed for trainers and athletes who want to maximise recovery and muscle growth during sleep. 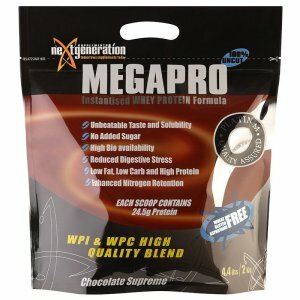 It can be used in a fat shredding, mass building or muscle maintenance program. 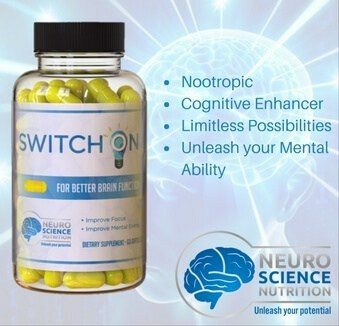 Recommended Usage – Take 1 serving about 30 minutes before bed. For a fat stripping, the program adds one scoop to a blender or shaker with 200 – 250 ml of water and mix for 20 seconds until thoroughly dispersed. For a mass building program add 1 – 2 scoops in 500ml of milk. Formulated with ULTI-GEN’S Growth Hormone Matrix and L-DOPA Support Complex, GENA-GRO will help you maximise lean muscle gains and build final size. GENA-GRO is the next generation in human growth supplements.